This is the letter Lin Dickens, our Marketing Director wrote to The Caterer commenting on their publication of the Top 100 Most powerful people in hospitality. 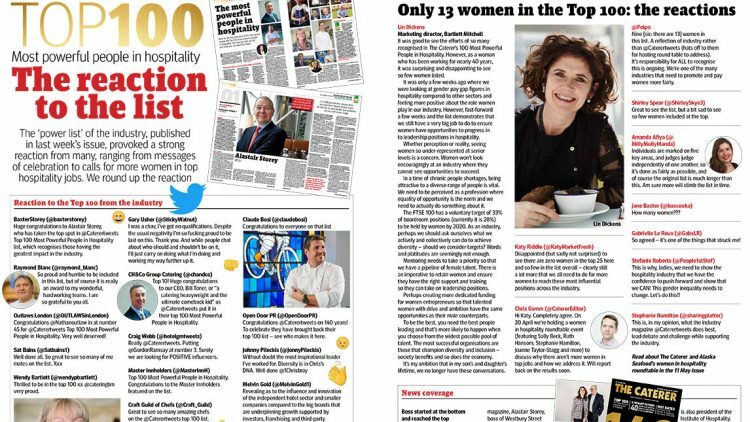 It was good to see the efforts of so many recognised in the the 100 most powerful people in hospitality, however as a woman who has been working for nearly 40 years, it was surprising and disappointing to see so few women listed. It was only a few weeks ago where we were looking at gender pay gap figures in hospitality compared to other sectors and feeling more positive about the role women play in our industry. However, fast forward a few weeks and the list demonstrates that we still have a very big job to do to ensure women have opportunities to progress in to leadership positions in hospitality. Whether perception or reality, seeing women so under-represented at senior levels is a concern. Women won’t look encouragingly at an industry where they cannot see opportunities to succeed. In a time of chronic people shortages, being attractive to a diverse range of people is vital. We need to be perceived as a profession where equality of opportunity is the norm and we need to actually do something about it. The FTSE 100 has a voluntary target of 33% of boardroom positions (currently it is 28%) to be held by women by 2020. As an industry perhaps we should ask ourselves what we actively and collectively can do to achieve diversity – should we consider targets? Words and platitudes are seemingly not enough. Mentoring needs to take a priority so that we have a pipeline of female talent. There is an imperative to retain women and ensure they have the right support and training so they can climb the corporate ladder and take on leadership positions. Creating more dedicated funding for women entrepreneurs so that talented women with drive and ambition have the same opportunities as their male counterparts. To be the best you need the best people leading and that’s much more likely to happen when you choose from the widest possible pool of talent. The most successful organisations and sectors are those that champion diversity and inclusion, society benefits and so does the economy. It’s my ambition that in my son’s and daughter’s lifetime we no longer have these conversations. Reproduced with permission of The Caterer where you can read the original Top 100 article.